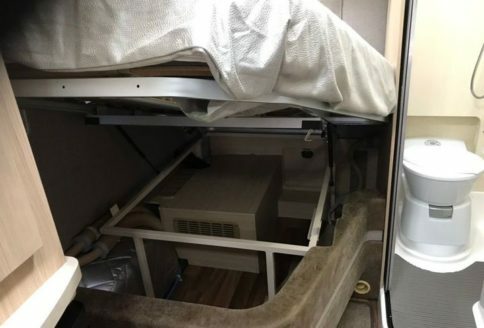 This is our Used Auto-Sleeper Kingham Fixed Bed 2016/65 Plate van conversion. It was first registered in January 2016, has had 1 owner and has covered just 7,500 miles. It is finished in Golden White Metallic with Catalan Berry fabrics and Verada Oak furniture. 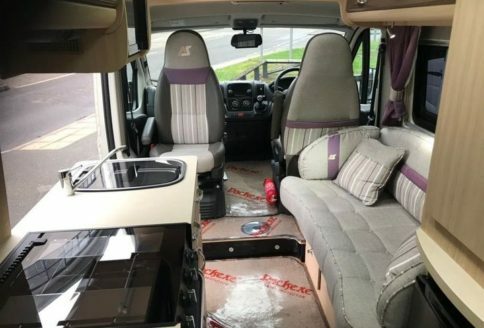 The Kingham is a fixed rear bed van-conversion with front lounge and is a two-berth motorhome. The engine is Peugeot’s powerful 2.2 turbo diesel with their 6-speed gearbox and is Euro 5 compliant. Our Kingham has a very impressive Auto-Sleepers specification that includes their Premium and Winter Packs. Special features of these packs include cab air conditioning, cruise control, alloy wheels as well as air top suspension. Other benefits of the packs are uprated heating, electric water tank blankets, additional insulation and a large awning. The engine is Peugeot’s powerful 2.2 turbo diesel with their 6-speed gearbox and is Euro 5 compliant. 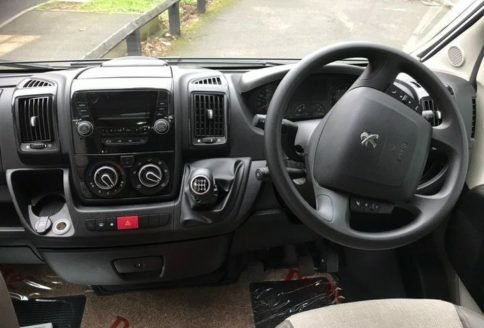 There is also a DAB radio, electric windows and mirrors, colour reversing camera and adjustable steering column. 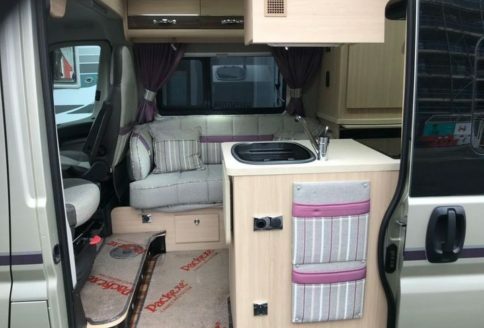 The cab and habitation carpets are removable for ease of use and cleaning and finally, there’s also central door locking and an engine immobiliser. Our Used Auto-Sleepers Kingham Fixed Bed 2016/65 Plate has an impressive specification. The kitchen features a 3-burner gas hob with a combination oven and grill. Overhead there is a duel-zone microwave oven and an electric cooker hood. The kitchen also features a large three-way fridge with freezer compartment and lots of useful drawer and cupboard storage. 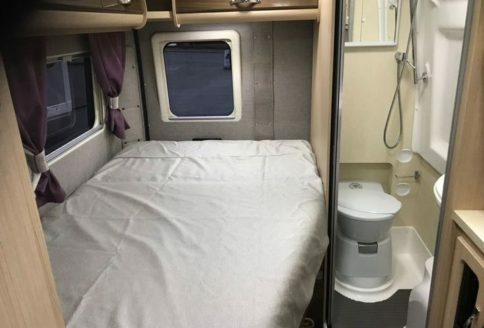 The shower room has hot and cold water, an electric flush cassette toilet and a shower. A very clever feature is the sliding sink that allows more space to shower when required. Warm air heating is ducted in to keep the room warm when required. There is a sofa in the front lounge area and both cab seat turn-around for extra comfort and convenience. Finally, the Kingham has a large double “French” bed with memory foam matrass and an adjustable head for comfort. The Kingham features a free-standing table for use inside and outside as well as a pedestal table between the cab seats. The sofa base lifts for access to storage space below, while the bed lifts too with generous storage below. Thus, there is lots of storage space in a Kingham. So, with good storage, there are also ample over-head lockers, found in the lounge and above the bed. For ventilation there’s a “Heki” roof-lite in the lounge and also the bedroom space and opening windows to each side of the lounge. The Kingham is pre-wired for TV with a TV point in the lounge and bedroom. The Kingham’s exterior features are just as impressive. It has bonded, privacy glazed “Athermic” glass which helps in keeping the vehicle cool in summer and warm in winter while also helping to prevent condensation. 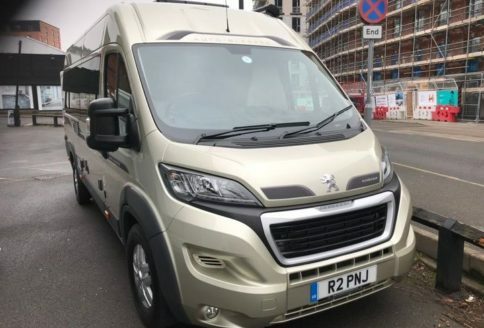 It also has alloy wheels, roof rails, a TV aerial, electric step and an awning. Finally, it has a refillable gas tank, air top suspension, a gas barbecue point, and colour coded front bumper. Part exchanges are welcomed.